A very nice looking kite, with good reinforcement, approx 1/3rd of the kite down from the wing-tips is in heavy duty fabric. A nice looking kite, with blingy gold trim. Battens on the wing tips, trailing edge and the usual battens along the leading edge. The kite isn't 1 pump or even 2 any more, each strut and the leading edge inflates separately (I'm really glad of this, as the tubes between the struts were always causing me trouble on my '07's). It's quick to rig up, due to the very good valves and pressure gauge on the pump, which mean you get it right first time, and have no problems with escaping air on the struts while you put the stoppers in. The leading edge has no valve, but its very easy to pull the pump out and get the stopper in quick. The first thing you notice is the power - I used to always say a C kite was less powerful than an equivalent sized Bow, but the gap has definitely been brought down in this case. My 12m is very good in the mid teens mph, and the 9m starts really performing when you get close to 20mph, which was a real surprise to me. I find myself needing to use a much smaller kite than I would normally have done, due to the big advances in low end power. This give the impression that the Vegas doesn't have as much de-power as before, but I think its merely a shifting of the amount of power down to lower wind speeds - which is definitely a good thing. The kites turn very quickly, and generate a good deal of pull whilst doing so - they fly mostly off the front lines, which means you don't get the pull on the bar when you encounter a gust, you feel it directly in your back, through the harness. One thing I love doing, and if you've seen me down the beach recently, is kitelooping these things.... they are amazing, they complete the loop so fast, they give you real confidence to really go for it, even when high above the water. The bar feedback is quite light, but enough to let you know where the kite is. When using the fish-pole technique for unhooked kiteloops, the kite even turns too fast, quite often looping twice before you get it oriented in the right direction again! There are freestyle settings on the kite which increase the bar pressure at the expense of de-power, but riding in the North East, i've never seen the need to try it out yet. Relaunch is very good, and mostly not necessary, as C kites don't tend to land nose down as much as Bow's do - if it does, a good firm pull on a back line flips the kite on its side, and relaunches quickly provided the wind is sufficiently strong. If its a bit light you need to use the 5th line to get it on its back first, then relaunch is straightforward from there. The Vegas Jumps very well indeed, and seems to have good upwind performance also. 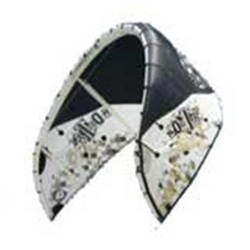 It is much more of an all-round free-ride/wave/freestyle kite than the 2008. Unhooked performance is as good as you'd expect from such a freestyle oriented kite, but the 2009 has a much wider audience in mind, remaining suitable for wave and free-ride use also, but perhaps not the most suitable kite for beginners.